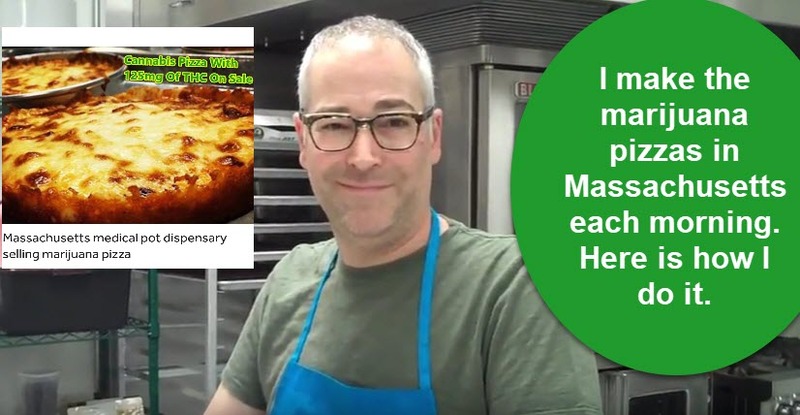 Cannabis.net was lucky enough to get an exclusive with the chef who makes the now famous marijuana pizza in Massachusetts. The pizza is sold at Ermont Dispensary in Quincy, MA. 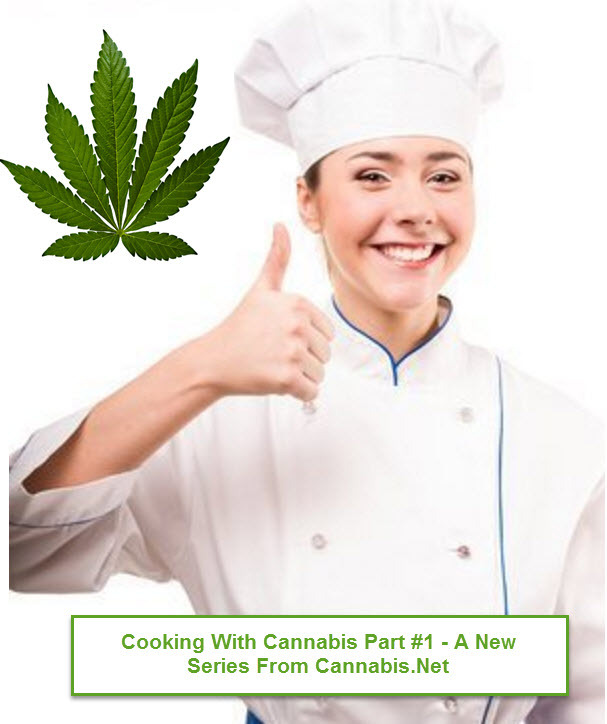 We got the full kitchen tour and even got some insights on how to make a great cannabis pizza at home. 00:02 Curt with Cannabis.net : Hey, guys, we are live at the now famous Ermont Dispensary in Massachusetts. You recognize the name? You might have seen our story yesterday on the cannabis-infused pizza, 125 milligrams. Being Cannabis.net, we asked for special backstage access to see how the pizza's made, talk to the chefs, and see how they came up with the idea for the cannabis-infused pizza. So let's take a look around at the secret kitchen. We are now somewhere hidden in Massachusetts. Just kidding. We are down in Quincy, Mass, walking through the now famous kitchen that creates these wonderful cannabis pizzas. As you can see, Ermont is planning on a big weekend. We have cartridges, we have edibles. And we come to our famous chef, otherwise known as Keith . Keith, how are you? 00:52 S1: What do we have going on today? It looks like we're making some brownies. 00:56 Keith: Yeah, we're making some brownies today. 01:00 Keith: I stocked up on pizzas yesterday. 01:01 S1: Alright. How'd you get the idea for the pizza, the recipe, or how did it even start? 01:24 S1: Just for our users, explain what kind of pie that is. We got worldwide here. 01:26 Keith: Oh, yeah. Bar pie is... South Shore bar pie, it's a thin crust pizza, baked in a pan, and it has a sauce with a lot of oregano, and it has a lot of cheese on it. 01:44 S1: So we are opening what? A frozen pie. You sell 'em frozen? 01:47 Keith: Yeah. This is if you buy 'em. If you come here and buy one, this is exactly how you'll get it. 01:51 S1: I'll have to take a look. 01:53 Keith: Evidently, wrapped this one upside down, but they'll come up just like that. It's par-baked, but not all the way, so you can decide how dark you want it. I like my pizza really well done. I don't put it on a pan when I make my... I eat a surprising amount of frozen pizza at home. 02:14 S1: [laughter] A lot of testing. 02:14 Keith: But I make it all, so it's alright. I just throw it on the rack, right like that. 02:18 S1: Alright. So how are the pizzas made? What kind of cannabis is in there? And how do you decide what kinda cannabis goes in? 02:24 Keith: We use a high-strength distillate. And a lot of our distillate is not necessarily strain-specific, that we use for edibles, but it is... The stuff that I used for this batch was about 85% THC. I think it was 85.4, something about that. So it's really, really refined and there's almost no flavor, so the pizza tastes like pizza, the way it's supposed to. 02:50 S1: I was just gonna say. So we're talking regular crust, cheese, sauce? 02:56 S1: And the cannabis is going in through the sauce? 02:58 Keith: It goes in the sauce, actually. 03:00 Keith: I make a slurry with the distillate and the olive oil that I use to make the sauce. 03:07 S1: And as far as decarboxylating, is the time you cook the pizza or the person buying it supposed to? 03:15 S1: So you're just heating up a pizza? 03:16 Keith: Yeah, but you just heat up the pizza. And it's really stable at that point, so you don't have to worry about baking off any of the cannabinoids. 03:25 S1: So what is the recommended bite size or are we talking one person, one pizza? Or do you kinda... What have you been [03:33] ____? 03:33 Keith: Ideally, yeah. One person, one pizza. We made them... I keep... Dosing, obviously's really important. I try to keep a lot of things the same. So the small, little, individual things that we make, that come in three packs are almost always 25 milligrams a piece: Cookies, brownies, muffins. The larger items that we make, they come in jars, so all the single-ingredient items like peanut butter, or olive oil, or Nutella... Those aren't really single ingredient, but we repack those. Those are all 1 milligram per gram. So a 300 gram jar of Nutella has 300 milligrams of THC. And then we put a label on it, specifying exactly how many milligrams are in each tablespoon. Does that make sense? 04:27 S1: Yep. We have a question. Can you change the THC to be more of a sativa-based, a CBD-based, or is it... Can a client come in and... Are you gonna make different styles, as far as heavy CBD, heavy THC? 04:39 Keith: We do different... Yeah, we offer CBD edibles, we offer THC edibles, and we offer one-to-one edibles that were 50/50. 04:48 S1: Good morning, Cherry. Good morning, Mackie. Good morning, Anthony. I think the audio's working. We have pretty good audio here and we're talking with Ermont. And if you've seen the piece on Boston.com, as well as Cannabis.net, on the cannabis-infused pizza, it's about 125 milligrams. And you say it's about 6 inches. We're here heating one up. 05:10 S1: We have brownies... Or we got little cupcakes coming out first. Let's get out of the way. 05:14 Keith: Lots of those. 05:15 S1: A lot of edibles being made this weekend. 05:20 Keith: Yeah. Unlike most kitchens, this one is closed on the weekends. 05:24 S1: There you go. [chuckle] Your busy time's now. 05:26 Keith: Yeah. [chuckle] This one is closed on the weekend. 05:32 S1: How long would somebody take that frozen pizza? How long would it take to heat up, do you recommend? 05:37 Keith: You know what? Right now, these brownies are on low heat. They're only on 300. This one's gonna take a little while. But if you want it nice and crispy, you do it at 400 degrees for, well, I don't know, eight minutes maybe? 05:53 S1: Okay, that's not too much. 05:53 Keith: Something slightly less than 10. You don't want it to get too dark. 06:00 S1: Thank you for sharing, Sharon. I see a lot of people sharing this now. We're up to about 50 people watching worldwide. And of course, this is our... Not to take away anything from Keith, but this is what everybody is wondering, how it's gonna come out. We're gonna take a look at it. We're on low heat right now. But if you can see in there, about a 6-inch cannabis-infused pizza, 125 milligrams THC. You can check our website at Cannabis.net, read the story from yesterday with a picture. And we're with the mastermind chefs in the back kitchen of where it's made. Again, we're in Quincy, Massachusetts. We have medical approved, as well as recreational. Recreational is not in effect yet. It will be, hopefully, hopefully next year, if our governor moves it along. 07:38 S1: [laughter] [07:38] ____ pizza. 07:38 S1: On the South Shore, come check out Ermont Dispensary. We're in Quincy, Massachusetts. They got a great supply of fresh stuff. You can grab pizzas, pre-rolls. 07:50 S1: Oh, pub cheese, too? 07:50 Keith: Yeah, pub cheese, we make pub cheese, you got it. Cookies, oatmeal raisin cookies, berry-lime muffins. 08:02 Keith: I like the sweets. 08:03 Keith: I eat the cookies. I eat the brownies. I'd like to make little layer cakes, but we're not quite there yet. 08:15 Keith: It is. It is. 08:17 Keith: And at that point, the distillate doesn't... Is free of terpenes. Terpenes are extracted separately. 08:24 S1: Okay. This is the... Ah! 08:26 Keith: This is the distillate, so you can see how clear it is. 08:27 S1: This is what it looks like. Gotcha. That is clear. 08:31 Keith: Yeah. That's because all the impurities have been removed. And so this does not have any strain specific terpenes in it. It is just a high strength THC. 08:44 S1: Alright, and that is what you mix in, if it's pizza sauce, or cocoa, chocolate. 08:47 Keith: Yep, because... And you can see it doesn't really have any odor. You'd smell it from here. 08:52 S1: We're gonna do it, smell. You guys can see that very clear distillate removed of terp. 08:57 Keith: [laughter] That's a stir bar and it's very, very thick. 09:11 S1: Pamela would like to know if you're hiring any cooks. Paul says he wish he was here. 09:17 Keith: We just hired an assistant. 09:18 S1: You gotta keep an eye on him. "Hi, any free samples?" Thank you. Well, I don't think in Mass law, we can do free samples. 09:24 Keith: I'm not even allowed to sample it, so I'm gonna have to go with no. 09:26 S1: That's right. Alright, no free samples, guys. 09:29 S1: But again, if you're in Massachusetts, you have a medical card right now, you can come down here. You can go to any dispensary in Mass, but if you like the... What? The homemade edibles, as well as the pizza. We're in Quincy, right off the highway. It's exit eight. We're very close to the highway, you just come right down. 09:44 Keith: Right down at Granite Links. 09:46 S1: Yeah, right. Right by the... Is it Granite Links? 09:49 S1: Granite Links Golf Course as well. There's a golf course here, so it's not hard to get to. [chuckle] If you're going to Cape Cod, it's right off the highway, just saying. 10:00 Keith: [chuckle] It is. 10:00 S1: Alright, let's take a look and see how... What it looks like, as we're getting a little closer... It's looking good. 10:06 Keith: Yeah, it's getting melty. 10:08 S1: Alright, look at that. 10:08 Keith: Oh, yeah. That actually, that's coming along nicely. 10:11 S1: You can't feel the heat, but there it is. 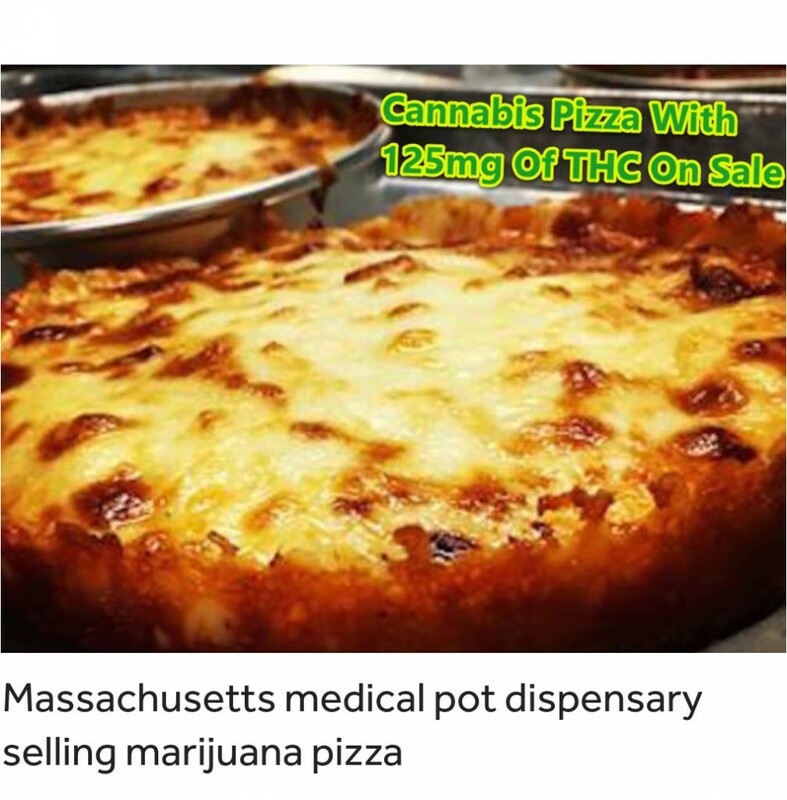 There's the picture from Boston.com, your cannabis pizza. 10:18 Keith: That one looks better, actually. 10:20 S1: [laughter] Yeah, I was gonna say, we're gonna get a better look. 10:25 S1: Did I hear a rumor they used to have 300 milligrams of THC? 10:29 Keith: What... That was just the very first one that we made. It was not... It was too much. The patients wanted it to be a little less. It was also a little bit of my... I don't wanna call it a mistake, but at the last moment, I decided that the pizzas needed more sauce. 10:53 Keith: So more sauce, more sauce and more dose. But that sort of thing is remediated by the fact that we send every finished product out for testing, so we know exactly what the dose is before it goes out. 11:05 S1: Okay. Steve would like to know, "At the temperature pizza cooks, how do you keep the THC from baking off?" 11:13 Keith: People... That's a... Not a misconception. To denature THC is a long and arduous process. When we wanna purposely do that, we need to apply heat for 48 hours or longer. So baking something for 15 minutes does not denature the THC. 11:35 S1: There you go, Steve. And I can't pronounce your name. You're either Greek or Russian, but I can see you're jealous of... Wanna be here right now. That's not the English alphabet, but you're glad you could join us today. 11:52 S1: Alright. Here we go. Let's get our camera angle right. Or we can get our distillate over here. Again, this is what goes into the sauce, as well as any type of edible. They're using pub cheese, chocolates, muffins, that kind of thing. So here it is. Oh, does it smell good... It's like a stuffed pizza. This must the debate. 12:22 S1: Okay, alright. Gotcha. 12:23 Keith: A South Shore bar pizza has a lot of cheese, that's one of it's... And see this little caramelized edge? 12:30 Keith: That's all, that's made of cheese. And that's one of the [12:33] ____. That's Adam's favorite... The cheese crown. 12:35 S1: And for this jumping on, the THC and the cannabis part is in the sauce. 12:40 S1: So the tomato sauce is how they get it in there. 12:43 S1: And you can see here, that we have a just heated up pie, total being 125 milligrams, so I assume you could share it with someone. I see ya, [12:54] ____. Yes, it does look good, smells delicious too. Let's see if I can move it over a little there and give you a little side shot. A little bit of a stuffed pizza. Again, bar pizza, when he says South Shore, he means South Shore, Massachusetts. This is the style of pizza and we are gonna try it later. Mass law does not allow me to take a bite right here. I will be... Well, we'll be buying one and we have to try it off premises. It's like consuming cannabis, same way; on premises, not allowed. 13:24 S1: Hang in there. We're gonna continue live. We're gonna take this with us. And when we get to a place we can film, we're gonna do a taste test, give you the quick review. And hopefully, you guys can come down to Ermont. Again, we're in Quincy, Massachusetts. We have medical approved. Recreational has been voted on, but you cannot come here into Massachusetts and buy rec yet. But if you're in Massachusetts, you're heading to the Cape, this is right off Route 93 on the South Shore. They have a huge kitchen. As far as the dispensary goes, plenty of cooking going on, labeling, it's a big weekend. If you're going down to Cape Cod, this is exactly where you wanna pull off. They're right off the highway. You don't have to get far into Quincy, you don't have to get lost. You get right off, it's up a hill, boom. You're in and out. It's a really nice dispensary. And if you're looking for something different on a Friday, you have your medical card, come on down. Try it down here. Pick up some pre-rolls, or pick up some distillate, or pick up some cartridges, or... Are we sold out of pizzas? 14:29 S1: No, we have more pizzas. 14:29 Keith: We just stocked up. 14:31 S1: Just stocked up. You can come down, if you're in Mass right now with a medical card and pick one of these up frozen. Take it home, heat it up. It's Friday, celebrate the beginning of summer. And then send us a review. Put a review online under this video. Tell us what you think. How was the taste, what were the effects like? We'll come back. Once we try it, we are gonna come back online and let you know. So for now, look at that pizza. Cannabis. MASSACHUSETTS CANNABIS PIZZA HITS NEWS, READ THIS. 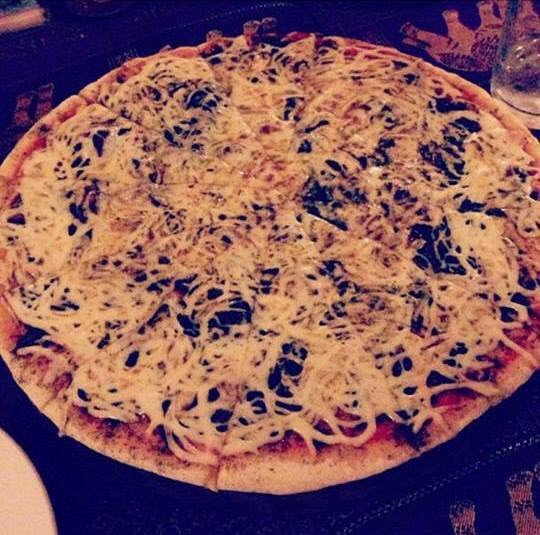 MARIJUANA PIZZA IN CAMBODIA, OR HAPPY PIZZA, READ THIS. Cannabis began to break down the religious walls I constructed over the years. It make me question the official dogma being force fed to me. With so many states legalizing weed, it begs the question: where should we grow it? 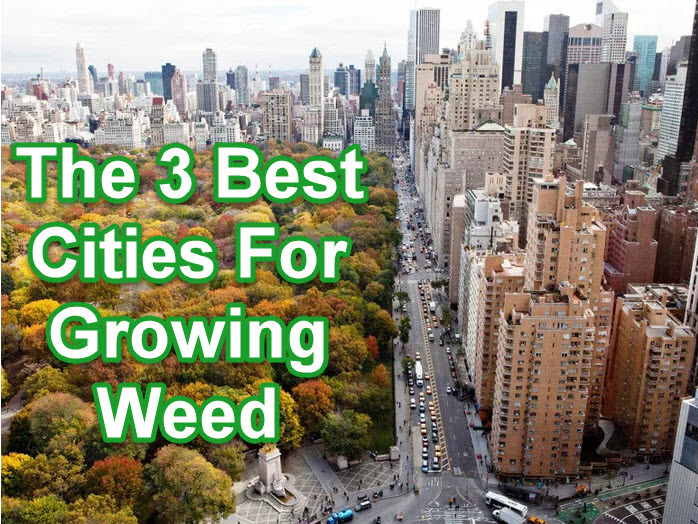 If you are thinking of dabbling in the marijuana business, we’ve made a list of a few of the best cities to grow weed based on a few factors. 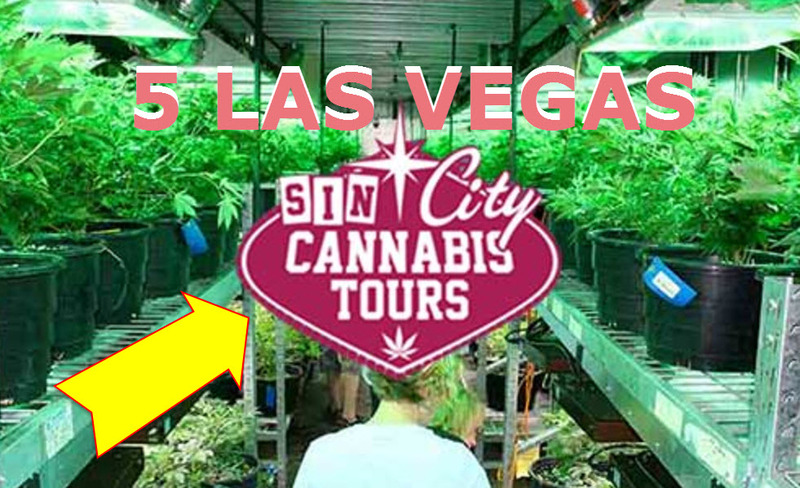 These tour companies offer a greener way of experiencing Sin City through many different fun experiences and activities, plus you no longer have to wait in line when you visit a dispensary.